With National Bike Safety Month and Bay State Bike Week taking place in May, the Cambridge Police have a number of events, initiatives and materials planned to increase the safety of all people who walk, cycle or drive. Officers and City employees will be stationed at highly trafficked areas in the city and will provide giveaways, fliers with bike safety tips and address any questions or concerns at the following areas. The MA Walk & Bike to School Day is taking place Wednesday, May 6 at 7:00am at the Vassal Lane Upper School. There will be bike tune-ups and games on Wednesday, May 12 at the Cambridge Public Library, which is located at 449 Broadway, from 12-2pm. CPD, Community Development Department (CDD) and the City of Cambridge will be taking part in Bike Tours of Cambridge on Saturday, May 16 at 10am. Ride details are available here. A free on-bike training course, which is geared for new bike riders and covers the basics of riding a bike, will take place at Danehy Park on Saturday, May 16 from 2-6pm. The training is sponsored by CDD and jointly instructed by the Cambridge Police and Mass Bike. Interested participants must RSVP with jlawrence@cambridgema.gov. A Healthy Aging Dinner & Focus Group on Wednesday, May 20 from 6-8pm that will focus on the conversation about barriers to bicycling for people ages 50+. Interested participants must RSVP with jlawrence@cambridgema.gov. CPD, CDD and many in the City of Cambridge will be participating in the Walk/Ride Day Corporate Challenge Outreach Event on Friday, May 29 from 7:30-10am. Be sure to view a complete list of events coordinated by the Community Development Department on their website. With the warmer weather, the Cambridge Police Department once again has a full staff of bicycle patrol officers riding the city streets. These officers not only help provide residents with a greater sense of safety around the city, but they will also be promoting safe driving, riding and walking, as well as enforcing traffic laws in the Commonwealth. One area of emphasis will be keeping bicycle lanes clear from illegally parked vehicles. Cambridge Police will also aggressively seek and look to mitigate bicycle theft. Thanks to a Sustained Traffic Enforcement Program Grant funded by Commonwealth of Massachusetts Executive Office of Public Safety and Security, Cambridge Police are collaborating with a number of community and regional partners to reduce overall crashes and injuries in the City through enhanced enforcement efforts now through September 2015. The Cambridge Police are soliciting bicycle safety-related tips and messages on Twitter and Facebook for the City’s electronic sign boards, which will be stationed in Inman Square, Central Square and other areas throughout May. CPD encourages residents to submit their suggestions in the comment field on Facebook. Each board can feature up to 18 characters at a time (36 with two rotations). In addition to the initiatives previously mentioned, the Cambridge Police will be leveraging their Twitter, Facebook and Instagram channels to educate bicyclists, motorists and pedestrians about the rules of the road, as well as offer theft prevention tips. The Department is also currently working on a series of Public Service Announcements in conjunction with the City’s Bicycle Committee (CBC) to provide a deeper understanding of riding, driving and walking in Cambridge from a bicyclist’s perspective. I can’t let Bike Month go by without mentioning a thing or two about some of the realities of the emerging bicycling infrastructure that is (unfortunately) favored by some individuals working for the City of Cambridge. Perhaps the most common problem I see are bike lanes painted on streets in such a way that right-turning motor vehicles are encouraged to turn across the bike lane at intersections. 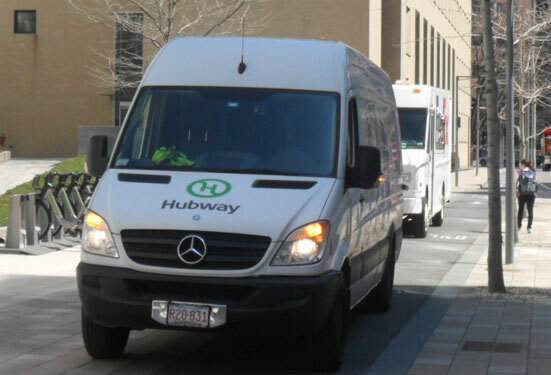 This is common along Massachusetts Avenue westbound from MIT heading toward Central Square, and I see near-misses daily. In those locations it would be much safer without the bike lane or with the lane reconfigured so that right-turning vehicles would be directed to move as far right as possible prior to turning – as required by state law. Cyclists being "right hooked" by turning vehicles is probably the most common cause of crashes. Another reality that I witness every day is the dysfunction of the Vassar Street "cycle track". This sidewalk-based bike facility was constructed in such a way that delivery vehicles, taxis, and other vehicles have no other option than to drive up onto the sidewalk (and the cycle track) in order to do what they need to do. I don’t fault the drivers in any way since there really is no other practical option. I’m entertained when I see official City photos of this facility showing nothing but right-way cyclists riding along an unobstructed path. The everyday reality is that cyclists routinely ride wrong-way on this track and pedestrians generally make no distinction between the track and the rest of the sidewalk. It’s like an obstacle course of pedestrians, parked vehicles, and turning vehicles and an accident waiting to happen. The better option is to ride in the roadway, but the right-of-way has been narrowed to the point where you generally have to "take the lane" to ensure your safety. Crossing Vassar is easily the riskiest part of my daily commute. To me a big bike safety issue is bicyclists riding at night in dark clothes with no all almost no lights and if any reflectors are on their bikes you can’t see them. My off-the-cuff analysis is that it is at least 50% of them. They endanger themselves and occasionally cause vehicles to have accidents – either with them or with other cars avoiding them. (And they often don’t wear helmets). Careless bike riding by some bike riders helps generate animosity by drivers to all bike riders. I completely agree about the lack of visibility of many cyclists at night. This includes wearing dark clothing, having no lights, and having insufficient lighting. It amazes me that in this world where seemingly everyone has a “device” that requires frequent recharging so many cyclists never even consider the possibility that the batteries in their front and rear lights needs to be replaced every now and then. I often see nearly invisibly dim red lights flashing at the rear of cyclists riding at night. Except for the rare sociopath driver, the simple truth is that motor vehicle operators generally don’t want to hit a cyclist – even a misbehaving cyclist. If each cyclist does his or her best to remain as visible as possible, that will reduce crashes more than anything else. A helmet may be good for reducing the extent of injuries, but it’s far more important to avoid injury in the first place. Finally, courtesy matters when cycling. This includes obeying the traffic laws, but it’s also helpful to offer a gesture of appreciation to other road users who operate their vehicles safely and within the law. Encouragement counts.